I study the Civil War because of my mother. It's a simple truth. My Mom, more than anyone else in my life, taught me to be the historian that I am. She is present in so much of what I do when I process the past. I lovingly refer to her as my idiot-filter. She was a theology major in her undergraduate training, studying comparative religions. I've never read her thesis, I know it's in a cupboard at my parents' house, but I vaguely remember that it was centered around comparing Christ with the other messianic figures of his era. She looked at the world as a game of measures, sizing up one thing and another, looking for the moving parts, seeking the humanity in what we call the divine. She taught me to look for people, not heroes. She taught me to look for people, not villains. She kindled in me the light of that quest for finding the humanity if the past. It started in elementary school. She signed us up for an afterschool activity, they called them clusters, about genealogy. Like most genealogy primers, it was taught by a dedicated local amateur. We dabbled. We played. We learned about microfilm and the Mormon Church, about tracing who was who when, and what they did with their lives. We sought out ancient obituaries for lists of survivors, fathers, mothers and places of birth. We combed for evidence. But the best piece of evidence was right under our noses the whole time. There is a family bible, nestled on a shelf in their house as well, with the classic inscriptions penned neatly in the cover. The words caught both of us: "William Henry Francis - Killed at Gettysburg, 2 July 1863." It's amazing what that one word, "Gettysburg," can do to the heart of an American fourth grader whose mother is a not-so-closeted Lincoln devotee. A sliced out signature, bought by my parents on some long ago trip to that sainted town, reading, "A. Lincoln," hangs on their wall. Lincoln, and with him a handful of words he spoke in that Pennsylvania town, loomed large in my upbringing. When I was a baby, my Mom didn't know any lullabies. She sang me to sleep with the piece of classical music she loved most: Tchaikovsky's 1812 Overture. I have war (perhaps of the cold and Napoleonic stripe) somewhere in my roots. We went searching. We dug hard for William Henry. We traveled all across New York's Madison County, digging through clerks' records and musty old books. We found him again, in the Union (now Walker's) Corners Cemetery. But the headstone there reads something different: "Buried at Gettysburg." That led to more digging, new skills. We discovered how pensions work. We found out that just because you were from New York, that didn't mean you fought for New York. 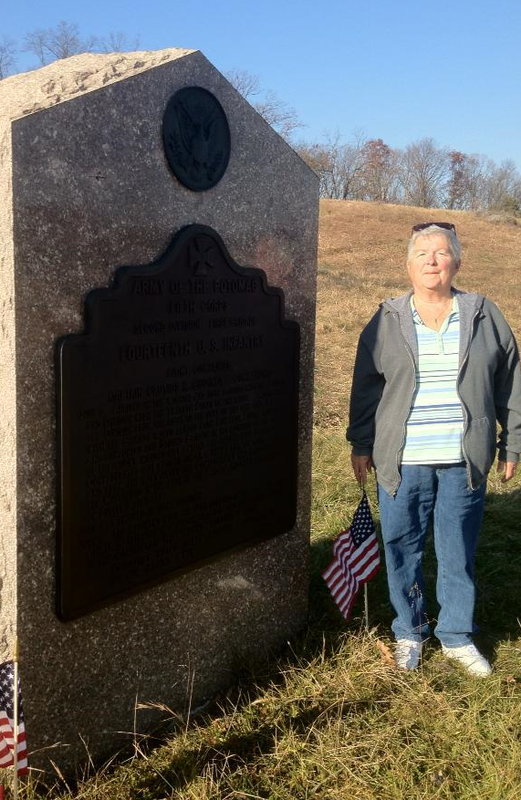 We found the 14th United States Regulars, we pinned down where William Henry Francis fought, bled and died for his country. Then the trail went cold. We tried again and again, I tried again and again. We could never find his grave. William is missing forever. I have no stone to lay flowers on 150 years after he died alone and forgotten in a muddy stream-bed. So I just kept right on digging. If I could never resurrect William Henry Francis, flesh of mine own flesh, I could do it for dozens, hundreds, thousands of others. I could bring back the whole human, not just the caricature. I could show the whole person, not just the portraits we hang on walls. My Mom taught me that life today is messy. Why did was assume that the past was messy too? So then we come to Monday. My fiancé and I were both jarred from bed this morning by ill tidings. My Mom was sick. I had already taken off of work. Jess and I were getting our marriage license. I would set out for North Carolina to check on Mom right after we finished that paperwork at the County Court Clerk's office. We drove down off of Seminary Ridge and into Gettysburg, the town where my Great-great-grand-uncle died, the town where my Mom's Abraham, the man she dreamed of and conjured in her imagination, spoke. It was different than the clerk's office where we found a cemetery register that led us to Union Corners over a decade ago. Jess and I swore an oath. The woman recording our information asked us for our vitals. Our information needed to be 100% correct, but if we were unsure about our parents, we could, "get it close." But it was important to us. The woman asked my Mom's birthplace, her maiden name, her profession. I answered, "school teacher." I could have said she was a ballet dancer, a war protestor, a theologian, an historian, a sage, a patient editor or a devoted friend. But school teacher seemed like just enough. As the woman typed in the information, I leaned to Jess. "A hundred years from now, some snot-nosed historian like me is going to use that information to track us down, to reconstruct today." We will forever reside in the Adams County Courthouse, on view for any future genealogist who wishes to come poking. I streaked down the highway to Durham, to Duke University Hospital. I held my Mom's cold hand, whispered, "I love yous," in her ears. She was sick. It was bad. She coded. The entire ward's staff rushed to her bed. My Dad and I watched as the heroes pumped her chest. They worked her heart incessantly, trying to breathe life back into her for eight minutes. It was an eternity. It didn't work. My Mom died Monday night, 149 years after that bearded man she loved almost as much as her devoted husband. She's gone cold, like everyone I study, I resurrect from the past. Practical necromancy might be possible, but perhaps it's slightly less practical than I had thought. I can bring her back to life easily enough, but I'll never make her live. This scar is here always. I don't know how to end this. Maybe that's because there isn't an ending yet, only a different sort of beginning than we all expected. Mimi Francis Rudy is enshrined in a database, a tiny scrap of paper in one archive in one county courthouse in a town known the world over for what they did there and what he said there. Her great-grand-uncle might not have a grave, but she will soon. And I'll put flowers there for her and for him. And my Mom will live on, another of the real human in my catalogue. She's likely the most important one of all, really. She started this whole mess. Now it's up to me to finish it. Oh, that I may have her strength, or at very least a fraction of it. 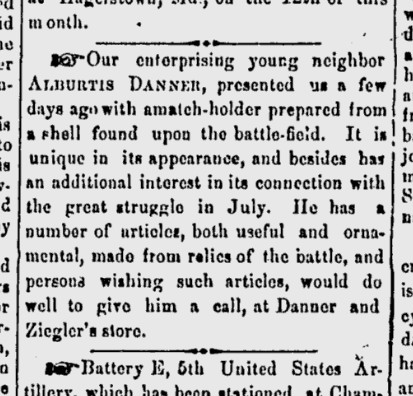 Nothing was happening in Gettysburg in the spring of 1864.
obviously impressed by Danner's handicrafts. That's not quite true. There was tons happening in the first few weeks of April 15 decades ago. But that "tons" was not massive or earth shattering. A dozen men and women died. Another handful of men and women found new lives in each others' arms. Life continued in this place just as it had a year before. It continued on in spite of the new cemetery, in spite of the war, in spite of the rebel arms and heads poking out of gardens alongside the budding spring flowers. Life was normal. But it wasn't normal. War changed this place fundamentally. Gettysburg was shaken to its very core by the battle. Torment, suffering and death warped the landscape and its denizens. Joel A. Danner was one of those poor souls warped by the hellscape of three days in July. The teenager was named for his father, and consequently went by his middle name: Albertus. The Danners lived on the Diamond at the center of Gettysburg, a massive family wedged into a modest brick home. When Lee and his armies invaded Gettysburg, Albertus was about 16 years old. War is adventure. War is excitement. And for Albertus, war was opportunity. What kid hasn't, on some ungodly hot day, tried to set up a card table by the roadside and sell lemonade? Capitalism is such a natural laboratory for the precocious young kid, turning lemons into lemonade, and then quickly into pocket money. But Gettysburg was warped and twisted by war. No part of life wasn't melted in that massive crucible. Albertus brought his own wares into Robert Harper's newspaper office. When life hands you lemons, you make lemonade. But what about when life hands you the detritus of the greatest mass bloodletting on the American continent? Harper's notice is typical enough, praising the "enterprising young neighbor," for his commercial pursuits. But these aren't refreshing drinks Albertus is selling. Instead, the teen presented the editor with, "a match-holder prepared from a shell found upon the battlefield." And it wasn't his only handicraft. 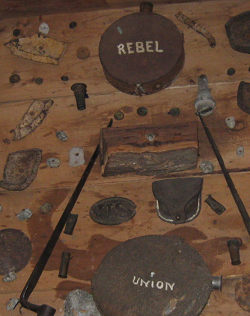 "He has a number of articles, both useful and ornamental, made from relics of the battle." War warped the childhood of every young man and woman in Gettysburg. For Joel Albertus Danner, war turned that simple impulse we all have, the impulse to experiment with our own hands and the market economy. into something slightly more sinister. When Albertus excised that childhood rite, he was selling tools of death, quaint reminders of a battle and the objects that helped end men's lives. War changed Gettysburg. Some might say it made the men and women who lived here callous to the reality of battle. War is about death. War is fundamentally killing. And maybe Gettysburg, even a century and a half later, hasn't quite recovered from the trauma of 1863. I've been gone a while. My brain has been telling me these last few week it's not just "a while," but it's in fact "too long." I'll likely explain the whys of the hiatus soon. Why do we forget that people are human? I've been asking myself that question more and more lately. Partially it's driven by a laundry list of things happening in the world, vitriolic attacks on humanity, both strangers and friends. I just see cruelty looming sometimes, particularly over the lowest in our society. But those we malign are so often the kindest hearts. Back in high school, I was active with our Civil War roundtable in Syracuse. We met at the Onondaga Historical Association's museum each month in downtown. Like every Civil War roundtable, ours was a motley crew of local history buffs, reenactor-types, war aficionados and those desperately looking to belong to a community. To some extent, that last category covers the whole lot. We had one stalwart figure who was at nearly every meeting. He lived at the YMCA. Syracuse is a burned-out shell of a city, a hollow form that is crumbling and dying. I suspect he came to every meeting partially because it was something to do in the evening. I also suspect that the Y being just right down the street had something to do with it too. Somewhere inside I know he was interested. During every presentation he was engaged and "there." But I suspect that we offered what we offered to any of the misfits who came through the door: community. Our Roundtable helped to restore Onondaga County's Civil War flag collection, including the 149th New York's banner that was shattered and pummeled on Culp's Hill in 1863. We specifically adopted the headquarters flag of Greene's Brigade of the XII corps. We were determined to restore it to its former glory. And, as with every huge restoration project, there were fundraisers. Our plucky little roundtable harnessed every event we could hitch our star to. 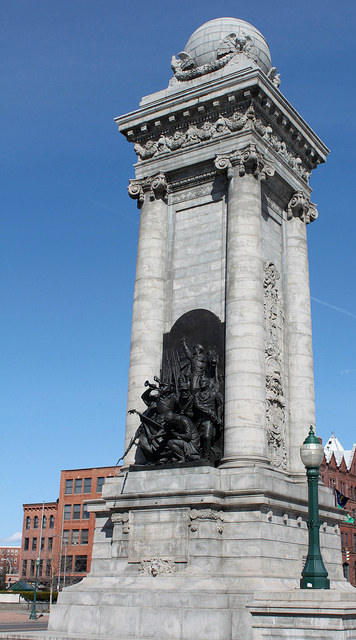 On September 2nd, 2001, the city of Syracuse rededicated its Civil War monument, in the heart of Clinton Square just steps from where the Erie Canal once flowed. We set up a few tables. My mom and I were helping sell postal caches. The little stamped and cancelled envelopes were a few bucks each. Sue Knost, a postmaster from Albany helped many nearby roundtables pull off these sorts of fundraisers; she was a great woman, a dedicated philatelist and a rabid Civil War nut. The cancellation was a line-drawing of Sergent William Lilly mending the flag at Gettysburg. I remember when that man who lived just a few blocks away at the YMCA came up to our table, pushing his cobbled-together and lovingly repaired bicycle along with him. He dug around in the watch pocket of his jeans and came up with a handful of wadded up dollar bills. He bought two of the cachets and thanked us, then wandered back into the crowd. I looked to my mom. "Do you know what that meant for him?" I asked in hushed tones. She was crying. I was too. I have no clue where my envelopes are now. They're likely in some unloved box in my parents' attic with the rest of my stamp collection. But I will bet you every dollar in my watch pocket today that he still knows where his are. It's also why I keep my money in my watch pocket. Every time I dig into that tiny pocket on my right hip, it's my reminder to myself that I have so much and others have so little. I remember that day and that postal cachet. And I remember that those who have so little still somehow care so much. About the only evidence I can find on the internet that this ever happened. in the 1990s and 2000s as it is a chronicle of curiosities from the 1860s.